Smash that deadline. Obliterate concrete, rock and asphalt surfaces faster using the heavy-hitting power of the Bobcat® nitrogen breaker. Its long piston stroke maximizes impact energy and reduces recoil, making your machine more productive on tough jobs. Protect that uptime. The nitrogen breaker requires minimal maintenance and reduces wear on your carrier. Grease points are within easy reach which makes routine maintenance faster. Its unique valve design reduces pressure fluctuations and strain on your carrier’s hydraulic pumps. And the single lower bushing simplifies repairs on the job. Long Piston Stroke: Maximizes impact energy and reduces recoil to deliver more force to the surface you’re working on. Single Lower Bushing: The single lower bushing is easy to replace on the job, which keeps downtime to a minimum. Unique Valve Design: The valves reduce pressure fluctuations within your hydraulic system, decreasing wear on your carrier’s hydraulic pumps. Carrier Versatility: Quickly and easily switch the nitrogen breaker attachment from a loader to excavator with the Bob-Tach® and X-Change™ attachment mounting systems, maximizing attachment utility. Easy, Minimal Maintenance: Designed for minimum downtime, the breaker has only two moving parts and all grease points are within easy reach. You can easily access the charge port to maintain nitrogen pressure inside the attachment. Easy Mounting: The Bob-Tach and X-Change attachment mounting systems make attachment mounting easy, decreasing amount of time spent attaching and increasing amount of time spent operating. Dust Suppression Kit: Keep dust exposure to a minimum with the optional water nozzle kit. This option will be available in early 2019. 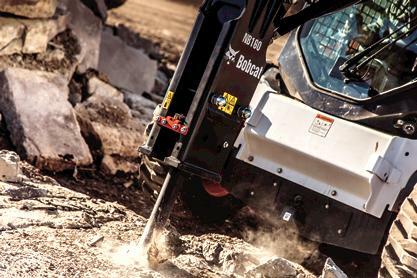 Breaker Bits: Bobcat offers a selection of breaker tools, equipping you with the right tool for each job. And each one is made with precision-heated steel to give you the longest service life.